I am so excited about how this piece I’m sharing today turned out! We renovated the Berry’s home for them on HGTV, and one of the problems they had was limited space to store their kids toys as well as TV equipment. We wanted to give them a piece that solved both issues, and this is what we came up with! I love everything about this piece, from the hardware to the design and that paint color! The first step to building this console is assembling the box of the piece. The majority of this table is built using PureBond hardwood plywood in Birch from Home Depot. We typically have the guys at Depot rip ours down, and we make the precise smaller cuts at home. To assemble this part, I used 3/4″ pocket holes and 1.25″ pocket hole screws using our K5 Kreg Jig. This is by far our FAV modelPeople often ask which Kreg Jig to start with. and will build small to huge projects. We have used the same model for years. You won’t regret it! Now line up the middle shelf and base shelf using wood glue and 1.25″ pocket hole screws. You can see here how that bottom shelf is lined up from the base of the side and middle pieces. After the base is assembled, build the front face frame of the table. 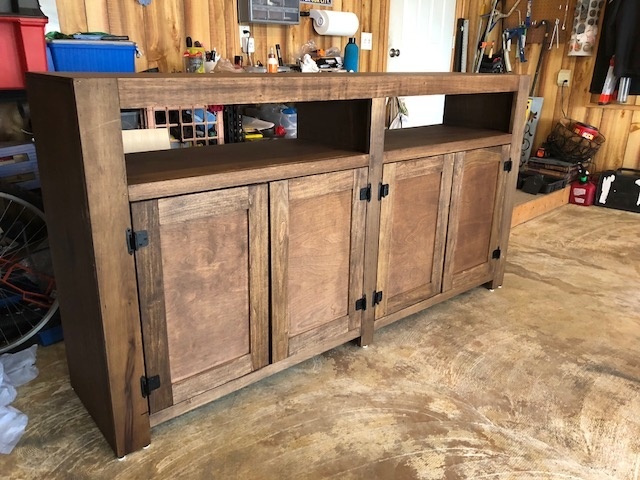 This is built using 1x boards and connecting everything using wood glue and 1.25″ pocket hole screws. Now, attach the face frame to the box of the table using wood glue and 1.25″ pocket hole screws. The top sides will show exposed hardwood plywood, but I filled mine with wood putty and sanded it down a bit before painting to give it a really smooth finish. The back of the console is 1/4″ hardwood plywood cut to fit behind the cabinet portion. I kept the top open to allow cords to be run behind the piece. Attach the back with 1″ staples. Final step is doors! These are created using panels cut to size and then trimmed in small wood pieces. It gives the piece a really modern feel and they are super easy to build too. I used 1/2″ brad nails and glue to attach the door trim. After that dried, I added the hardware. I really wanted hardware that would make this piece pop, and I found a company online that sells different and antique style hardware and fell in LOVE. It’s called House of Antique Hardware. Check them out and try not to love everything. These are the hinges I used for the doors. These are the pulls I used on the cabinet doors. That sums it up guys! Let us know if you have any questions at all! Happy building! Where did you find the 1/4×3 for the door panel trim? How much did it cost to build this media cabinet?? Where did you buy the lamps? Also curious what paint color you used! Love the piece! What paint did you use to paint it? really loving that color. Interested in building this media console table, but would like to change the dimensions. If I was to 10-12” longer will I have problems with the doors staying shut because they will be longer? In the last picture of the whole living room where did that little side table come from that’s by the couch? for the face frame did you rip pieces from your plywood or did you buy 1X2? It’s best to use 1x2s so you don’t have to do any extra finishing to the edges. If you used plywood ripped down you’d still have to laminate an edge on it or fill with wood filler and sand it down to make it smooth. Can you let us know how much it cost to complete this project? It looks great! Also, what color stain did you use?